they get bright yellow heads, a yellow patch on the front of their necks, and dark feathers on the back of their necks. 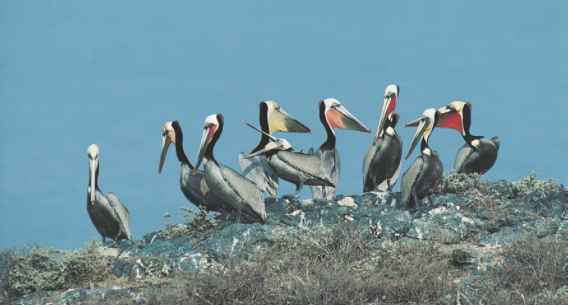 The pouches of the brown pelicans in western states turn from gray to red. The webbing between their toes makes these birds strong swimmers but awkward walkers. They are about 51 inches (129 centimeters) long from their bill tips to their tails, and they weigh about 8.2 pounds (3.7 kilograms). 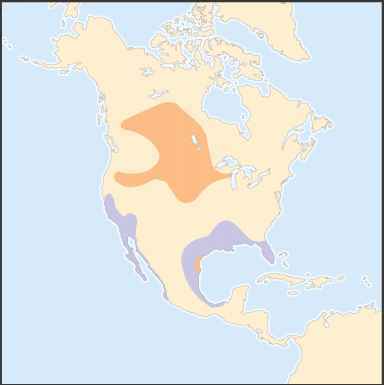 Geographic range: Brown pelicans live on the seacoasts of North, Central, and South America. They can also be found along the coasts of Cuba and other West Indies islands. Habitat: Brown pelicans stay close to the ocean year round and nest on islands. They live along the coast and also in estuaries (wet areas near the ocean where saltwater and freshwater mix). Diet: Brown pelicans are famous for their spectacular headfirst dives from as high as 65 feet (20 meters) in the air. They scoop up fish in their huge pouches. After making a catch, they drain the water out of their pouches before swallowing the fish. They occasionally catch fish while sitting on the water. the sides of cliffs, either in trees or on the ground. 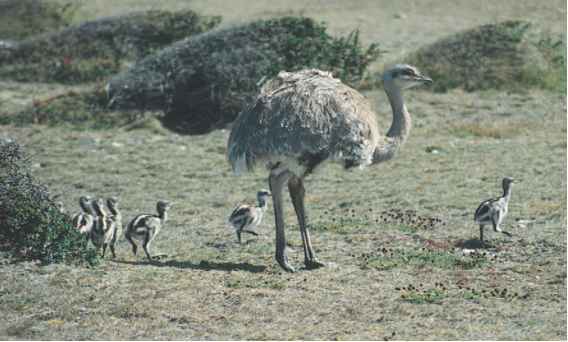 The females usually lay three eggs, and the parents take turns keeping them warm for about a month. When the naked chicks hatch, they soon start screaming to be fed. The parents feed them regurgitated food from their pouches. Young brown pelicans can fly and feed themselves by the time they are eleven weeks old. Brown pelicans and people: People love to watch brown pelicans in action, and they are often the main characters in children's stories and poems. Despite the popularity of the birds, people in the United States almost killed them off in many states with poisons intended for insects. The birds are sometimes injured by swallowing fishhooks and getting tangled in fishing lines. In South America, people gather their droppings to use as fertilizer on farms.